Approximately 4 million babies are born each year in the United States, with an average of 6,000 of those babies having Down syndrome. So, what is the likelihood four babies with Down syndrome would be born over four days in a row at the same hospital? 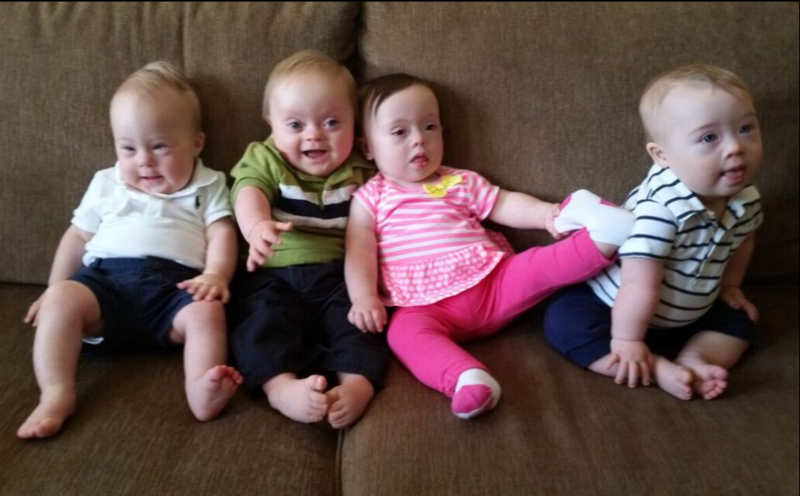 Meet Clyde, Ivan, Emily, and Jake; four babies who each happen to have an extra chromosome and were born a day a part from each other (July 28 – 31, 2014) at WellStar Kennestone Regional Medical Center in Marietta, Georgia. The day following Emily’s birth, Ivan arrived. “Ivan is the funniest and most loving child and would give up anything for a good cuddle,” said his mom, Nadia. Ivan makes it known his likes and dislikes, but at heart is “a total goofball and loves to make silly faces to make people laugh.” He also loves his dogs and any reason to be outdoors, whether it’s his swing, sand or water. Soon the families decided to meet to get to know each other, and their little ones, better. Nadia remembers this meeting fondly and recalled walking away from it with an overwhelming sense of comfort in knowing “You’re not alone in this.” Added Nancy, “From the first meeting, we all bonded and quickly formed friendships that will stand the test of time.” It was at that point, the parents decided to make this first meeting the first of many. The families now meet once a month for a mini play group. At their June 2015 get together, the topic of the Atlanta Buddy Walk® (hosted by the Down Syndrome Association of Atlanta) arose in conversation. Nancy reflected, “It is so powerful and amazing that we all found each other; there was no doubt we would be on a team together for the Buddy Walk®.” Soon after, Team Kennestone Krew (named for the hospital where the babies were delivered) was born. Stay tuned for Part 2 of the Team Kennestone Krew blog spotlight!